Streets will shutter to cars from Disney Hall to Hollywood, all in honor of the LA Phil’s 100th anniversary. 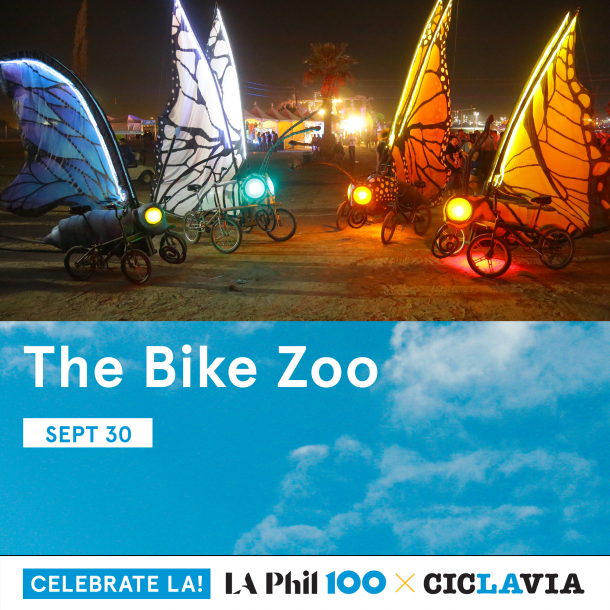 When the LA Phil announced in the fall of 2017 that a free, mega-of-scale open streets party was in the works, one that would have CicLAvia as a partner, one that would celebrate the legendary music outfit’s centennial, one that stretched from Walt Disney Concert Hall to the Hollywood Bowl, the first word that many locals must of thought was… wow, how? Such a goal could be achieved, of course. It would be done, to be sure. But closing such a lengthy route to vehicles seemed to be an undertaking that would out-big every other closed-to-cars street festival ever to grace our big city’s big thoroughfares. And “big” is the keyword as you study the route map for the Sunday, Sept. 30event, which was just released by the LA Phil on the morning of Thursday, July 12. The event’s name? Celebrate LA! LA Phill 100 x CicLAvia. A few notes? There are six hubs along the eight-mile route, with stages for live entertainment: Walt Disney Concert Hall, MacArthur Park, Koreatown, Melrose, Hollywood, and the Hollywood Bowl. The main streets to be closed, from DTLA to Hollywood, include Grand, Wilshire, Western, Melrose, and Vine. Sizable portions of those streets will be closed to cars, of course — not the entire street, do note — but know before you go what will be shuttered and where and when. Helpful to keep in mind? The closed-streets route doesn’t actually go all the way to the Hollywood Bowl, but there will be a Bowl shuttle from the route’s Tinseltown terminus. The hours are 9 a.m. to 4 in the afternoon. Activities and happenings along the way include the LA Phil 100: Photo Booth, the Music Mobile Instrument Petting Zoo, yoga, art, and a ukulele workshop. Artists to perform at the hub stages include Dengue Fever, Las Cafeteras, Ozomatli, and so many other major singers and music acts. The concert at the Hollywood Bowl later that evening will include Gustavo Dudamel, Herbie Hancock, Kali Uchis, YOLA, and the LA Phil, with more artists to be announced. This will be one of the biggest parties of the early fall, one of the most joyous, one of the most starry, sizable, and free. Whether you bike it, walk it, or turn out for a favorite band’s set, best start plotting your course from Hollywood to DTLA, or DTLA to Hollywood, or somewhere between the two, now.